With the holidays right around the corner and the pressure building to find perfect gifts, I'm grateful beyond words for online search. Search is how I make sense of choices; it's how I educate myself; it's how I get ideas and figure out who to purchase from. The same goes for our customers, whether searching for business products or consumer ones, whether those products are destined for Christmas stockings or normal day-to-day operations. That means that the pressure is increasing for our businesses to get found online. If we can get into our customers' heads - or walk in their shoes - we can better understand the questions and issues they have. Once we do, we can address those on our website, in our blog content, in our email communications, and on social networks. We can share our expertise with them via our online content in a way meaningful to them. 6 Steps for Successful Content Marketing Using SlideShare's Secret Search Sauce focuses on SlideShare, a powerful social network built around presentations. Once customers find you, consider having readily available on your home page an offer that they might download - and which gives you the opportunity to capture lead information about them. To learn how that offer might fit into your overall marketing, consider downloading our latest eBook about "How to Create Effective Inbound Marketing Campaigns." It's highlighted in the sidebar. Finally, the blog articles below provide perspective on the customer experience, on how to get started with attracting visitors and converting them into leads and customers and how to ensure that the relationship building emails you send customers are ones they welcome and open! Wishing you and yours a wonderful Thanksgiving ...and great success searching! Wondering how to translate the hard-earned knowledge you have about customers and their problems into a means for generating leads? Consider developing a content offer campaign focused on prospective customers that guides them while highlighting the expertise you have. Our new eBook explains how. 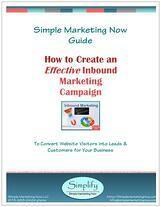 This new eBook, titled How to Create an Effective Inbound Marketing Campaign, helps you develop marketing campaigns to effectively connect with - and convert - prospective customers searching for solutions you offer. Won't you download the offer? If you are a member of MarketingProfs, and want to know how to set up goals in Google Analytics, you may enjoy watching Take 10: How to Create Goals in Google Analytics. That means that you're ready to embrace a different approach for attracting visitors to your site, converting them from visitor into lead and eventually into customer. In other words, you are ready to dump outbound marketing tactics in favor of a gentler, more practical trust-building approach for connecting with customers. And yet, that's not what we experience with email marketing nowadays... Too much of email marketing is about outbound marketing.